This painting was done in direct emotional reaction to the deaths of Princess Diana and Mother Theresa coming within a week of each other. Two icons of international women from opposite ends of society it was fascinating to watch the pageantry back-to-back. Women bear the brunt of societies mistakes whether it is war or just plain poverty. Their ability to create life has given them a special relationship with death. Death is often given over to the women within a given culture. Bodies must be washed, dressed, and prepared for burial and in most tribal societies, this is woman's work. So I painted death and women only to find that I had done a classical four races painting. 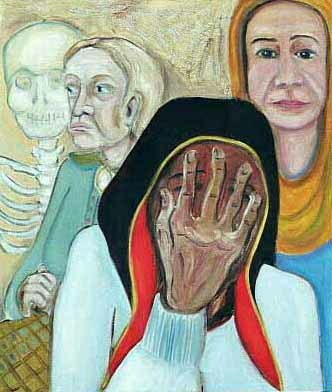 The skeleton is white, the old woman is a sickly yellow, the young matron is red and the grieving woman is black. In death as in life, we are all one.